A high-resolution model of Hurricane Katrina shows the deadly storm in never-before-seen detail, as it gains speed and crashes into southern Louisiana and the surrounding region. Ten years after the devastation caused by Hurricane Katrina, NASA has helped scientists better understand why the storm was so devastating, and how to save lives in the future. 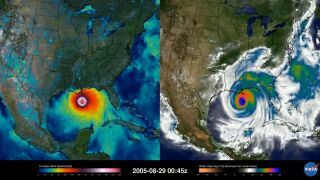 A new video, created by scientists at NASA's Goddard Space Flight Center, shows a high-resolution simulation of Hurricane Katrina as the storm moved across the Atlantic Ocean, then the Gulf of Mexico, and finally collided with the southern United States. You can see watch the hurricane video here, courtesy of NASA. "Since Katrina, scientists have learned a tremendous amount about the environmental conditions and inner-core processes that affect a hurricane's path and intensity," NASA officials said a statement that accompanied the new video. The images below show one of the ways that hurricane studies have improved in the last 10 years. The two images show water vapor concentration as Hurricane Katrina neared the U.S. coastline with the Gulf of Mexico. The first image, taken in 2005, has a resolution of about 31 miles (50 kilometers). The image shows water vapor within Hurricane Katrina on Aug. 29, 2005, at a 50-km (31 miles) resolution, the resolution of most global models in 2005. The second image, created in 2015 using observational data and the GEOS-5 model, provides a roughly 4-mile (6.4 km) resolution. The new model provides higher resolution of other variables, such as near-surface wind speeds. The image shows water vapor within Hurricane Katrina on Aug. 29, 2005. The image is from a 2015 version of the Goddard Earth Observing System model, Version 5 (GEOS-5), at a 6.25-kilometer (3.88 miles) global resolution. NASA and other space agencies collect data relevant to hurricane studies using many methods, including sensors on board satellites, aircraft and on the ground. Scientists at NASA's Global Modeling and Assimilation Office, Goddard, are working on improving how that data is ingested and integrated into new models, in order to make it useful for scientists and people trying to improve hurricane warning systems. "It used to be that we always looked for the mechanisms that allow hurricanes to rapidly intensify, but as of late, the question has gotten flipped around," Scott Braun, research meteorologist at NASA's Goddard Space Flight Center in Greenbelt, Maryland, said in the statement. "Now, we ask what are the factors that prevent a hurricane from intensifying." One advancement in this area has been a better understanding of the role of so-called "hot towers," or tall thunderstorm clouds that carry heat upward. Around 2005, the statement said, scientists thought the presence of hot towers could intensify a storm. Now, scientists think the effect is more specific: A large amount of rising hot air needs to be concentrated between the center of the cyclone and its strongest winds. "The lifting of air can be accomplished by a small number of deep and intense hot towers or by a larger number of weaker updrafts," the statement said. "Think of it like lifting a heavy box — it can be lifted by one or two strong people or by a large number of weaker people." Over the last 10 years, scientists have also come to better understand how wind shear can stop a hurricane from intensifying. Wind shear occurs when wind changes speed or direction with height, so wind near the top of a storm may be moving in a different direction or much faster than wind down below. Understandably, scientists think this kind of variation can rip a storm apart. "At the time of Katrina, we knew that wind shear was a strong negative influence [on storm strength], but now we're learning much more about how it interacts with storms to affect their structure and intensity," said Braun. The lack of shear winds may have been on reason that 2005 hosted such a high number of powerful storms. The evolution of those storms is explained in another hurricane video from NASA's Goddard Space Flight Center. Many variables appear to influence the path and intensity of tropical storms, cyclones and hurricanes. Scientists at NASA are also investigating the effects of dust and dry desert air on hurricanes. The more factors scientists understand, the better they can predict where these storms will go, and how strong such events will be. "By the time Hurricane Katrina hit the U.S. Gulf Coast, the storm had lost strength but was still able to cause immense damage," NASA said. "Even though the destruction was high, the damage could have been worse if it were not for the forecasts. But no matter how accurate the track forecast, there are still mysteries to solve about hurricane behavior to further improve forecasting."